The fundamental question of “Public Worship, Private Faith” is this: if Sacred Harp (shape-note) singing was born out of a music reform movement led by educated clergy, why is it now associated with American folksong? 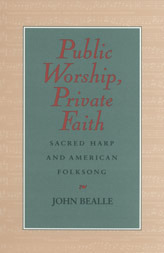 To answer this question, Bealle delves very deeply and intricately into the history of sacred singing in America; if the reader doesn’t already own a general understanding of the Bealle’s subject, his prose, written in a very scholarly style reminiscent of a doctoral thesis, will be often difficult to navigate. However, for those already familiar with the names Isaac Watts, William Billings and Harriet Beacher Stowe, Bealle’s book contains some historical gems. Isaac Watts, the great British hymn writer, in an attempt to introduce his hymns to Psalm-singing Americans, dedicated one of his hymns specifically to New England and sent one of his collections directly to Cotton Mather. Although his hymns were eventually embraced in New England, his chaffing references to the British state and sovereign initiated an American edition of his works.William Billings, the iconoclastic, quintessentially American composer apparently garnered an incredible amount of musical antipathy among his fellow Americans, even long after his death, especially among those who favored European musical styles. And Harriet Beacher Stowe, author of “Uncle Tom’s Cabin” and daughter of prominent musical reformer, Lyman Beacher, peppered many of her historical novels with musical references that reflected her New England, Psalm-singing background.All these anecdotes are presented within the framework of the constant deliberations over sacred music in America. One of the first of these debates was the contest between “The Common Way,” that is, “lining out” familiar music for the congregation to follow and “Regular Singing,” or note reading. Regular Singing was introduced to remedy the growing lack of musicality in worship services, but the singing schools – which featured this musical instruction outside of the church and tended to favor European melodies over American -- became in itself another controversial subject, which Bealle discusses at length.Bealle introduces shape note singing into the text with reference to a little book called “The Easy Instructor” which first introduced fasola singing in America around the time of the camp meeting revivals at the beginning of the 19th century. Bealle initially implies that shape-note books may have been used in camp meetings; then, like a good doctoral thesis writer, he provides detailed information that completely contradict this supposition.What of Bealle’s initial question: why has shape-note singing been defined as folk music? That connection, he argues, is basically the work of shape-note enthusiast (and native northerner) George Pullen Jackson, who wrote his ground-breaking works on the subject in the 1920's that forever afterwards placed shape-note singing within the context of American folk-song.Bealle’s book will not be of much assistance for those searching for a straightforward introduction into the history of shape-note singing, but for those willing to delve deeply into a very detailed, if occasionally difficult, history of early American sacred song, “Public Worship, Private Faith” holds some interesting rewards. (This review appeared at BookPleasures.com).